General Grievous returns while Finn travels to a post-apocalyptic alternate reality on Adventure Time! This week in the world of cartoons, Clone Wars continues the David Tennant saga and tosses the Younglings into their first adventure while Regular Show and Adventure Time return! The Younglings are on their own! 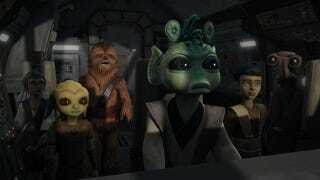 The Younglings infiltrate the pirate base, while Obi-Wan Kenoni is reunited with General Grievious this week. Gunji shows off his lightsaber in the first clip - he might be my new favorite Star Wars character. Ahsoka is in danger, leading the Younglings (with their newly created lightsabers) to set out to find her. David Tennant makes an appearance in this episode as well, an episode which also sees Kenobi face Grievous in a lightsaber duel. Adventure Time – "Finn the Human & Jake the Dog"
Adventure Time kicks off with a two episode block that picks up where Season Four ended, continuing the story of Finn and Jake chasing The Lich. In the first of these episodes, Finn wishes the Lich out of existence, leading to an alternate timeline. In this alternate world, Jake and Finn are separated, so Jake falls in with Prismo. Prismo knows that Jake can change everything back if he makes the correct wish, but will he? Regular Show – "Bald Spot"
It's Muscle Man and Starla's one year anniversary, so Muscle Man tries a little grooming and gets a haircut. In the process, the barber leaves a nice little bald spot on Muscle Man's head and Muscle Man handles the hang-up really well. My Little Pony: Friendship is Magic – "Too Many Pinkie Pies"
Pinkie Pie doesn't like making decisions, so she uses a magic mirror to clone herself so that she can spend more time for friends. Do we really need an Equestria full of Pinkie Pies? This is probably the shortest clip we've ever shown on SMC, but it has some really interesting imagery. Teenage Mutant Ninja Turtles – "The Gauntlet"
April gets a message from her captive, leading the TMNT+1 to set on a quest to save him. This mission leads them into the hands of Kraang, who is threatening to detonate a mutagen bomb. Top image courtesy of Lucasfilm and Cartoon Network. My Little Pony: Friendship is Magic airs Saturdays on The Hub, while Adventure Times airs Monday nights on Cartoon Network. Teenage Mutant Ninja Turtles airs Saturdays on Nickelodeon while Clone Wars airs Saturday mornings on Cartoon Network.